Heavily backed by labor unions, the bill, AB 880, is being lobbied vigorously with an accompanying marketing and advertising campaign. The proposal would mostly affect large “box” store operators, restaurant chains, and janitorial firms. It would levy financial penalties to employers of 500 or more people if workers qualify for the state-financed medical coverage. 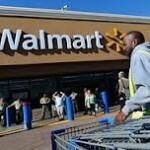 Why focus on WalMart and big nonunion employers? Even big union shops don’t pay enough to keep their employees of welfare! The LA Times ran a chart with their article on this bill that showed that the third biggest user of Medicaid in Ohio was Kroger. Kroger is a giant conglomerate that owns Ralphs, Food 4 Less, Foods Co., Quik Stop and Fred Meyer, to name a few. Kroger is a union company – 75% of Kroger employees are represented by the United Food and Commercial Workers. More smoke and mirrors intended to get the heat OFF the crooks running this state who are actively engaged in featherbedding..
On The Waterfront…right here in California. I’ve got a better idea. Instead of going after people that make jobs, why don’t we take our F.U. legislature and make it part time, cut all the perks and save everyone one big headache?? I always favored minimum wage / NO benefits for all government employees. Heck, I actually wish we would only have 1099 employees everywhere, let each employee pay their costs with their earned money. Stop with the tricks and gimmicks. Then when Wal Mart starts getting rid of employees and goes to more robotics and automation will the legislature pass another law requiring Wal Mart to hire people they do not need? This is just another stupid law written by short-sighted people. And some crazy people call California business unfriendly. Gee I wonder why? All of us job creators at this site have more important things to do. Like sitting around in the middle of the day in our cheap underpants commenting on everyone elses shortcomings. I’ve been thinking about automating also. Excuse me? I for one, am not sitting around in cheap men’s underwear. In fact, I have Frigo No. 1 underwear that costs $100.00 a pair, praise! Where did slomike say anything about sitting around while wearing MEN’S underwear? Is your computer possessed by Satan where you didn’t see slomike’s quote above? Key word; “our” cheap underpants, implying that slojoe’s initial post has him sitting around in his underpants as well. slomike: I am going without. As a cost-cutting measure. So I can continue to meet payroll. I believe the term is “going commando” which I am doing my part to help the bottom line!!! It’s just too bad we didn’t get a single-payer healthcare system in place which would include preventative care that would save billions of dollars. Lobbyists and greed to make money from the dying and the overall well being of our citizens is ungodly. It is coming, that has always been the goal! Tell me again why someone offering me a job must ensure that I have health insurance? Can they also pay my water bill? My car insurance payments? What else can I get someone offering me a job to buy me? Tell me why I would want to hire rOy, if in addition to wages, I gotta pay for his health insurance, water bill, car payment, and pedicures. For me, it might be more effective to automate, or move out of state, or import labor (by sourcing pre-constructed widgets). Everyone ought to have access to health care, but Everyone ought to pay for it, not put the burden of their health care on their employer (or anyone else). The union doesn’t get that because the union has never had to make payroll or do anything more than receive things from others. That’s the entire point of the article – big box employees aren’t paid enough so they can afford to buy insurance, and they’re not offered an employee insurance plan, so they end up on Medi-Cal. The companies are exploiting both their employees and all taxpayers. If the taxpayers would demand that companies either pay a living wage or offer an employee insurance plan, fewer people would have to rely on welfare programs. Let’s start with companies and the agriculture industry only hiring workers here legally in the US and paying living wages and offering health insurance. The California legislature could help by sealing the border, and by not offering more freebies to illegals. What?!?! Don’t you want people from Nevada and Arizona sneaking over the border and stealing our job? If people are not paid enough, then they should try to get better jobs – OR – there needs to be some drastic measures to reduce the costs of healthcare providers so that the price can come down. Say… tort reform? Say… get government OUT of healthcare? Whatever did we do without government run, government mandated health insurance? How did the human race even survive? I remember years ago, when I was very young, a manager at one of my first jobs said to me….”your employer doesn’t owe you anything, except a paycheck”. I’ve always remembered those words! please, push it off on the taxpayers. no, wait, i’m going to pay for it either way. no cheap underpants.